OB Rag’s “Rapid Response Network” changes Union-Tribune Poll on crossing grocery workers’ picket lines. 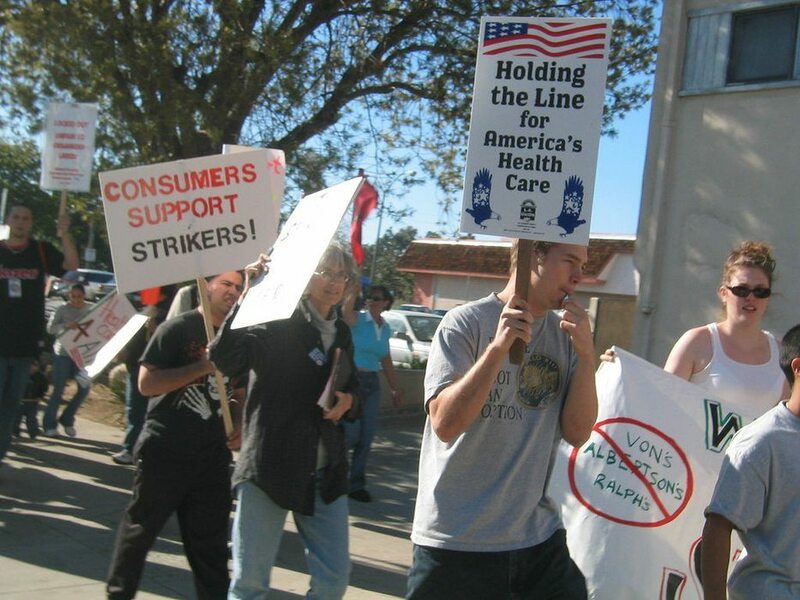 2004 grocery workers picket line during their strike. Last weekend, we noticed that the San Diego U-T had a new poll up – as they do every Saturday in their print edition. This one asked readers whether they would cross a striking grocery workers’ picket line. The online SignOnSanDiego version had the “yes’s” winning. So, the Rapid Response Network recently put together by progressive bloggers and others from last weekend’s Economic Summit jumped into the fray. Messages and emails were sent out or placed on several facebooks, twitter, and out on email blasts to have people join the poll. 46.4% Yes, I’m a loyal customer. 53.6% – No, I’ll shop elsewhere. This is a good way to influence public opinion,now maybe we could get something done in the policy department. If some people (customers) did some pre-emptive bitching in the check out line or something maybe it would help shore up Joe Workers’ bargaining power? Probably wouldn’t do any harm as long as it was kept civil. Are the Teamster supporting the strike? If they don’t deliver, the customers would go to other stores. If the Teamster cross the line at the stores why wont the customers cross? Yes, the Teamsters will support the strike, if there is one. Will they? Or will it be half-hearted support like last time? Teamsters, as I understand it, pulled up to the lot line of the stores and other employees unloaded the trucks. Goods were delivered, regardless of the strike. The striking workers were supported in name only, as contracts and dollars were at stake. While I agree and would love it if they did support the strike, general strikes like this are illegal, and this should probably be remembered when admonishing the members instead of the union leaders. Also, I would try contacting the teamsters themselves. building revolutionary ties among the members, even if the bosses don’t approve, would be helpful in further actions. Oh, Mitch – and which revolution is that exactly? the one thats gonna happen if they keep takin stuff away from the workers, that’s the one. Just watch. Older Article: Ocean Beach woman survives shark attack … in Puerto Rico.